Jon was raised to the sublime degree of Master Mason in 2013 and has been a valuable member of this lodge ever since that day. He went straight to work, help out wherever possible, even earning himself a "Grand Lodge Rookie Award". Jon has served on various lodge committees and as an officer since he was raised. His enthusiasm, and devotion to our craft serves to inspire many others around him. This year Jon has been entrusted with the role of Senior Deacon. He will bring real dignity to that honorable post. Jon is a life long resident of Evansville, and graduated from Benjamin Bosse High School in 1998. Jonathan has worked for Springleaf Finance (formerly American General) for 15 years in various capacities, currently specializing in regulatory compliance. He is also a member of Trinity Anglican Church, and serves on the church's Vestry. Junior Warden: William F. Johnson Jr.
Raised to the sublime Degree of a Master Mason in 1983 and appointed to the line by MWGM Darrel Veach. Served as Master of the Lodge in 1989. Has been treasurer for twenty-one years, worked the ID program for three years, worked Trick or Treat on Main Street for the past three years. Works all fundraising shows. Was a mentor for about six years. For the past nineteen years, worked as Senior Deacon in the Past Masters' Degree. Is a 2010 Meritorious Service Award recipient in Scottish Rite being recognized for 20+ years of degree work representing participation in a total of 80+ degree presentations in 40+ reunions and has enjoyed every minute of those years. Joined the Hadi Shine in 1983. 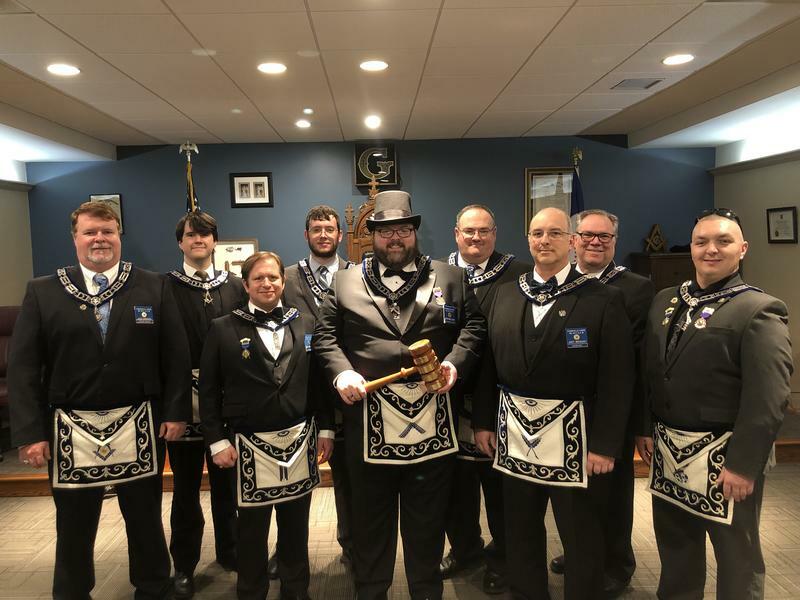 Has had the privilege to conduct hundreds of investigations of prospective members of which five of those brothers have since gone through the line at the lodge and two have since become Potentate. Joey Weigant was the Master of the lodge in 2014 and 2016. He had not really had the opportunity to serve the lodge as a traditional master, as his year was extremely busy with renovating our current home. This year, with there being some breaks in the officer line, he was asked if he would like the opportunity to serve again in 2016, this time in a more traditional role as master, and he agreed. We are lucky to have Joey as our secretary for 2018. This will be a great year for Evansville #64. Dedicated and Tireless Worker. Randy and his brother Terry have been a powerhouse in the renovation of our new lodge home. Terry is the brother of Randy Eades. He is a fine man, good Mason, and a working Shriner. When it comes time to help out or we are looking for volunteers to put on a project, Terry is there. This is his second year as a trusty for Evansville Lodge and he does the job well.